The Obama Doctrine is a kind of Neocon Lite strategy…a way of pursuing American imperial wars stealth-like with less of a directly visible American footprint and less of an American body-count . 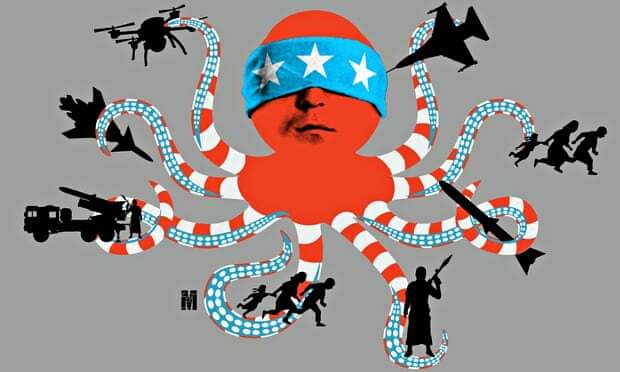 The Obama Doctrine is wars by remote-controlled drones, by contractors, by CIA plots, by mercenary armies, by cyber espionage and infiltration attacks. And even as Obama pursues a “nuke deal” with Iran he has surrounded that country with 45 military bases and he has armed Israel, the Saudis and other Sunni Arab countries with hundreds of billions of super weapons! Plus of course he never makes mention of Israel’s vast arsenal of hundreds of nuclear weapons and advanced delivery systems.